Today I would like to tell you about a unique monument in Poland that is still not very well-known, although many have heard of it. 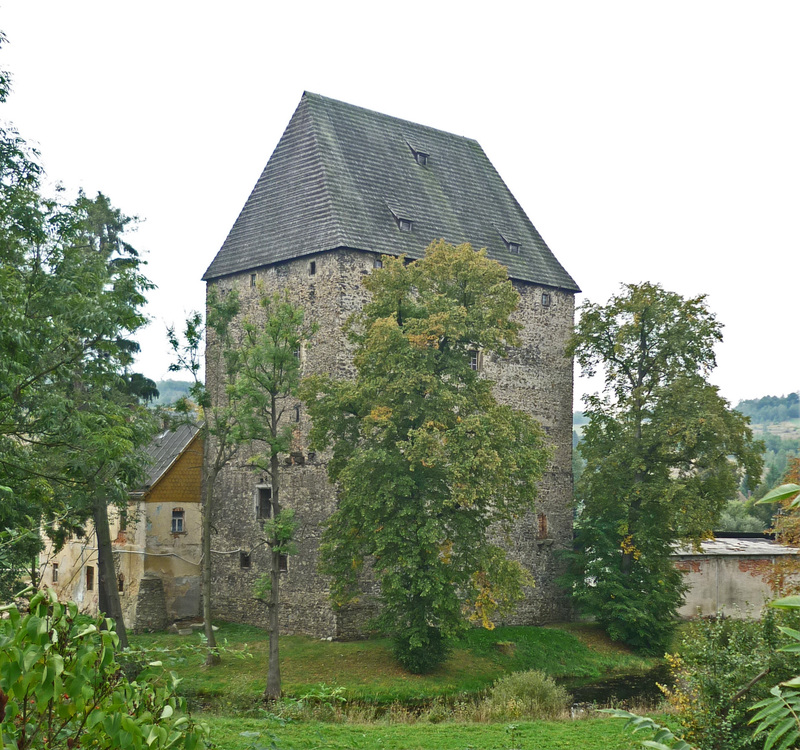 It is the Ducal Tower in Siedlęcin near Jelenia Góra (Lower Silesia), dating back to the first half of the 14th century and decorated with the murals depicting the legend of Sir Lancelot. Some time ago I wrote here about the three main cycles of the medieval literature: the Matter of France (containing the stories of the paladins of Charlemagne), the Matter of Rome (based on mythological themes taken from classical antiquity) and the Matter of Britain, which concentrated on the tales of King Arthur and the Knights of the Round Table (post available HERE). Sir Lancelot belongs to the latter group, and in fact he is a main hero of most of the stories. The most popular text of the Arthurian cycle was so called “the Prose Lancelot” (also known as the Vulgate Cycle): written in French ca. 1210-30, it tells the basic story (about Arthur, Merlin, the Grail Quest, an affair of Lancelot and Guinevere and it ends with the Arthur’s death). It was really popular, as about 150 manuscripts of it survived until today; there were also versions translated to other languages. Most of the survived illustrations of the legend of Lancelot come from those manuscripts; the frescoe cycle is rather a rare bird, although probably it was not so uncommon in the Middle Ages. 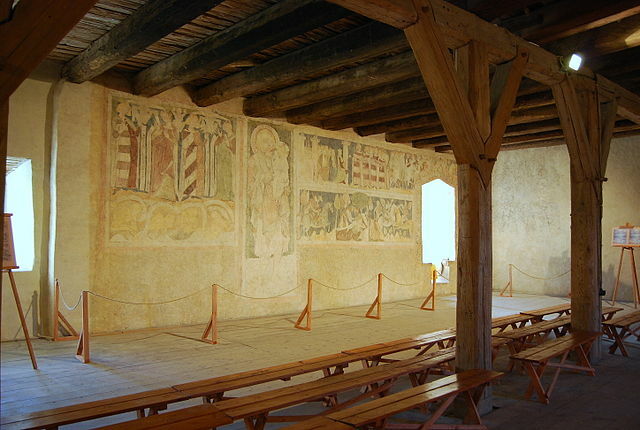 Today there are some remains of Arthurian cycles in the murals in some Italian residences (the Lancelot cycle, for example, was in the fourteenth century tower in Frugarolo, Piedmont). The Tower is Siedlęcin is, in this case, both a unique monument, and a proof that the medieval courts of Silesian Piast Dukes were “up to date” with the contemporary western-European culture. 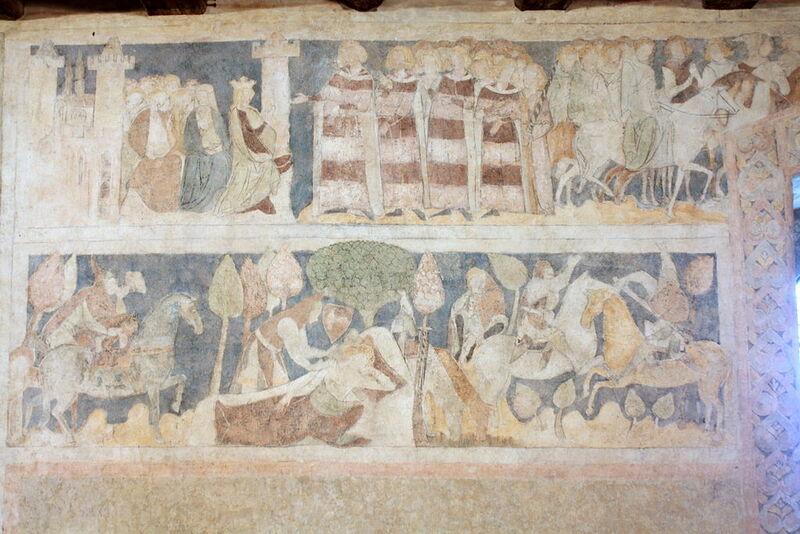 Two registers of scenes in these murals depicts Lancelot as the finest knight: his position is reflected in his victorious duels and in the fact that he miraculously healed Sir Urry. 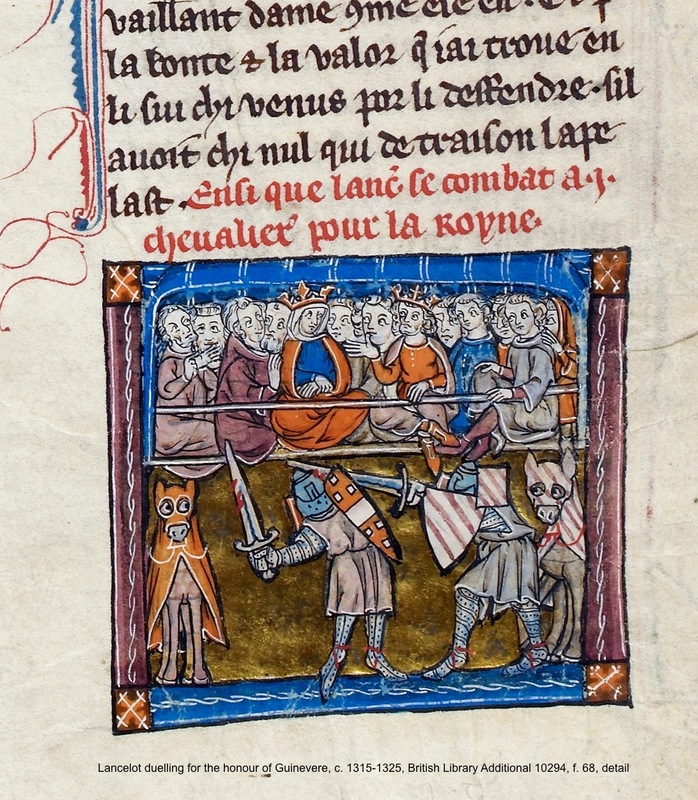 On the other hand, Lancelot was in fact responsible for the events that led to the death of Arthur and the fall of the Round Table: all because of Lancelot’s affair with queen Guinevere. 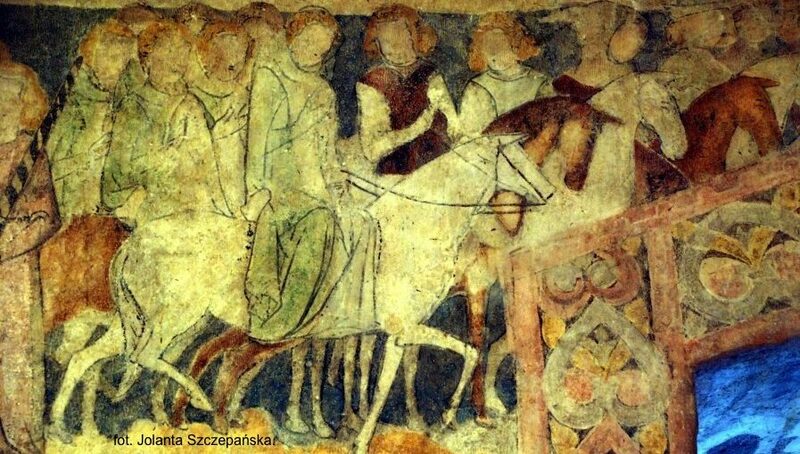 The upper register of the decorations in Siedlęcin depicts the beginning of that sinful relationship: queen Guinevere was abducted by Malegant, and Lancelot saved her, but as a result they fell in love with each other. The adulterous relationship was eventually revealed and it led to the series of events that ended up in the fall of the Kingdom of Arthur. Lancelot himself, because of his sin, was not able to get the Holy Grail, although he did get a chance to see it. So he lost a chance to succeed as a knight because of a woman; but that part of the legend is not depicted in Siedlęcin. The cycle ends with the image of Lancelot and Guinevere falling in love. The queen and the knight are holding their hands, which at first seems respectable, but then we notice that they hold each other’s left hands: that means that their relationship is adulterous. The founder of the tower and its decoration was duke Henry I of Jawor, whose wife was Agnes of Bohemia. 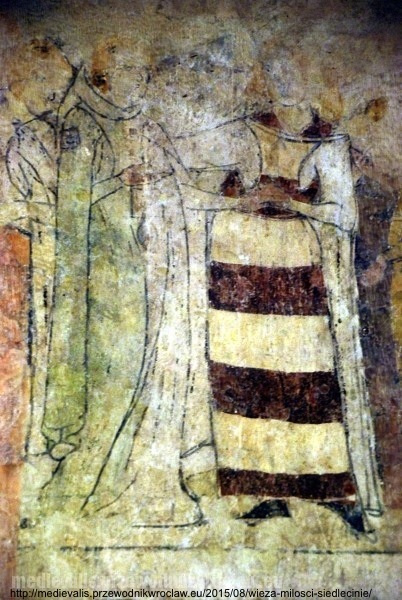 There is a grave effigy in Lwówek Śląski, which most likely depicts that couple: there are a lady an a knight, holding their hands. This time they hold each other’s right hands – that is because their relationship is not sinful. Henry and Agnes had no children (just as Arthur and Guinevere), but they left behind a very precious heritage: monuments showing the splendour of courtly culture of medieval Silesia. They probably together enjoyed those romances, which ended up as the decoration of their residence; their tomb also presents their marriage as a partnership. I hope after seeing that you will never again think of the Middle Ages as of a time of darkness and decay. I would like to thank Mrs Katarzyna Ogrodnik-Fujcik for the inspiration to write this post; you can read more about the Siedlęcin Tower HERE, or consult the article L. Marek, P. Nocuń, Knights of the Round Table of the tower in Siedlęcin, Silesia, “Acta Militaria Mediaevalia” IX, Kraków – Rzeszów – Sanok 2013, s. 89-127 (pdf available at academia.edu).